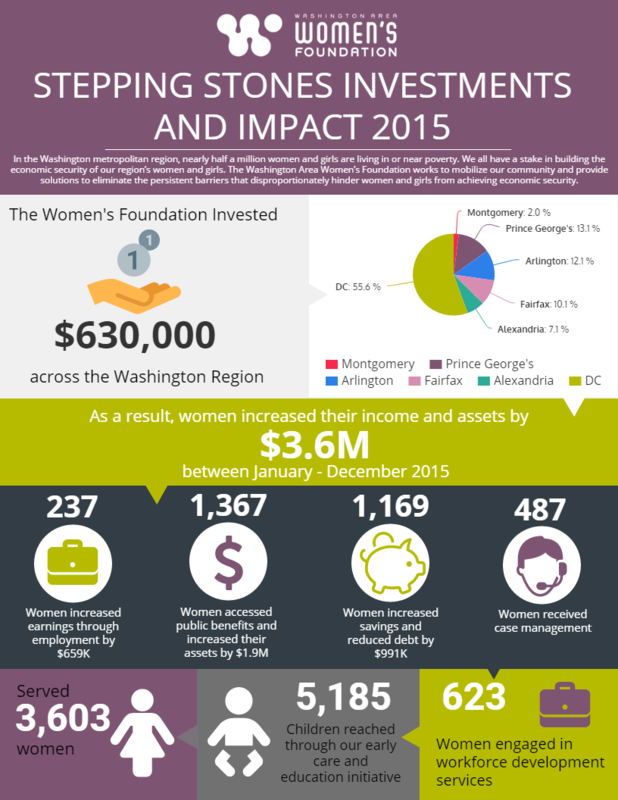 Get to know Washington Area Women's Foundation. We've invested over $11 million in grants to more than 170 community-based organizations, and it doesn't stop there. The Foundation launched Stepping Stones, our premier grantmaking program, in 2005. Since that time, we have helped over 16,000 women increase their income and assets by $53 million. Learn more about this transformative grantmaking program. Through our new strategic plan, we are returning to our roots, embracing a bold vision and entrepreneurial thinking. We are committing to moving the nearly 500,000 women and girls living in poverty to a place of consistent economic stability. Together We Thrive - find out how when you read our latest strategic plan. Our research aims to present a clear picture of the lives of women and girls in the Washington region—the District of Columbia, Prince George’s and Montgomery Counties in Maryland, Arlington and Fairfax Counties in Virginia, and the City of Alexandria, Virginia—that could be used as a basis for action. The Blueprint represents the collective voice of more than 250 young women, policymakers, philanthropists, scholars, service providers, and government officials, and provides guidance for policymakers, government entities, community based organizations, school districts, and funders on how to address challenges identified by young women of color living in the District. The George Washington University Milken Institute School of Public Health (GW), with support from The Alexander and Margaret Stewart Trust and Washington Area Women’s Foundation (WAWF), conducted a community needs assessment aimed at providing an in-depth analysis of the family planning landscape for women aged 15–29 in DC. This comprehensive community assessment, which includes both primary and secondary data, was designed, implemented, and analyzed between July 2017 and May 2018. "A Fair Chance: Improving Outcomes and Reducing Barriers to Success and Opportunity for Girls, Young Women, Transgender Young Women and Gender Non-Conforming Youth of Color in DC" provides key statistics regarding the state of young women and girls in DC. "Towards A Thriving City: A Review of the Impact of the Proposed 2018 D.C. Budget on Girls, Women and Families" is the first of its kind for the Foundation. The report provides a detailed analysis of proposed expenditures in relation to the needs of low-income girls, women and families in the City in critical areas such as housing, childcare, social supports, workforce development and violence. in our region is within our grasp if we invest with a gender lens and tap into the unprecedented giving potential of women philanthropists in our region. Washington region -- particularly low-income women -- and identifies some of the strategies of successful workforce development programs that provide women with the effective education and job training programs necessary to build economic security. This issue brief highlights key issues and demographic trends in the Washington region, and dives specifically into issues of poverty and opportunity that affect girls’ capacity to attain economic security in adulthood. In this issue brief, we look at the economic state of women in the Washington region and how we can address the obstacles challenging them and foster strategies that support them in their journey to economic security. A case study of nontraditional job training programs for women with lessons learned and recommendations for the field. In 2013, The Women’s Foundation expanded its target population to take a life cycle approach, launching a new strategy for investing in our community’s girls. This issue brief discusses the challenges facing low-income middle school girls in our region, and the two-generation approach we're taking to address them. April 10, Equal Pay Day in 2018, symbolizes on average how far into the New Year women in the United States have to work to earn what men earned the previous year. Nationwide the gender wage gap is 19.5 percent. The wage gap has been narrowing due to women’s progress in education and workforce participation. However, at the current rate of progress, the gap in the United States will not close until the year 2059. Here are some key facts you need to know about the gender wage gap in the Washington region. Early care and education investments help prepare low-income children ages zero to five for kindergarten, a critical opportunity to increase readiness and close the achievement gap, provide an important work support for low-income working families and support the professional development and advancement of early care and education providers. In this fact sheet, we explore early care and education in our region. An analysis of the 2016 American Community Survey by The Women’s Foundation finds that women continue to be disproportionately affected by poverty in the Washington Region. We dig into the numbers in this fact sheet. More than ever, families rely on women's earnings to make ends meet. This fact sheet explores how the persistent wage gap affects the economic security of women and their families. An analysis of the 2016 American Community Survey by The Women’s Foundation finds that women continue to be disproportionately affected by poverty in Prince George’s County, and that among women, single women with children and women of color are more likely to live below the poverty threshold. This and more facts in our poverty fact sheet. An analysis of the 2016 American Community Survey by The Women’s Foundation finds that women continue to be disproportionately affected by poverty in Montgomery County, and that among women, single women with children and women of color are more likely to live below the poverty threshold. Learn more about poverty in Montgomery County in our fact sheet. An analysis of the 2016 American Community Survey by The Women’s Foundation finds that women continue to be disproportionately affected by poverty in Fairfax County, and that among women, single women with children and women of color are more likely to live below the poverty threshold. This and more facts in our poverty fact sheet. An analysis of the 2016 American Community Survey by The Women’s Foundation finds that women continue to be disproportionately affected by poverty in the District of Columbia, and that among women, single women with children and women of color are more likely to live below the poverty threshold. Explore more statistics in our poverty fact sheet. An analysis of the 2016 American Community Survey by The Women’s Foundation finds that women continue to be disproportionately affected by poverty in Arlington County, and that among women, single women with children and women of color are more likely to live below the poverty threshold. Find out more information in our poverty fact sheet. An analysis of the 2016 American Community Survey by The Women’s Foundation finds that women continue to be disproportionately affected by poverty in the City of Alexandria, and that among women, single women with children and women of color are more likely to live below the poverty threshold. Find out more in our poverty fact sheet. Our FY15 grants helped women increase their income and assets by $3.6 million. See more impacts of these grants. 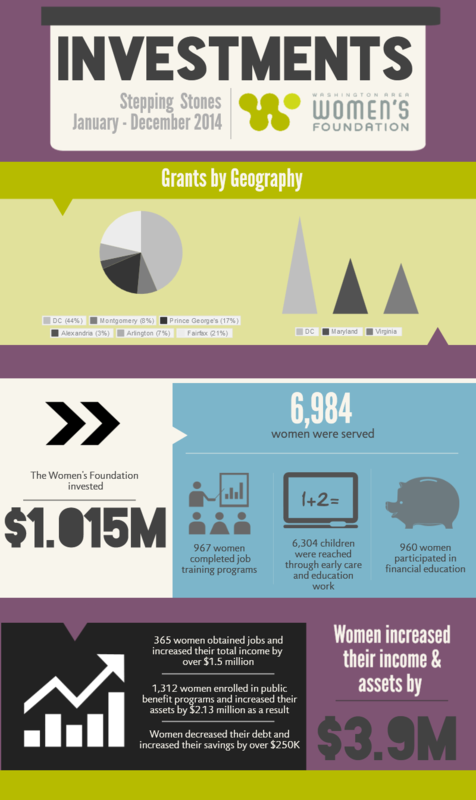 Our FY14 grants served 6,984 women and helped women increase their income and assets by $3.9 million. See more impacts of these grants. We look at how men and women differ in how they volunteer, use their talents and donate money. How do the mothers in our region participate in the workforce, and how does it compare to fathers? Transportation costs in our region affect many aspects of women's lives and their economic security. 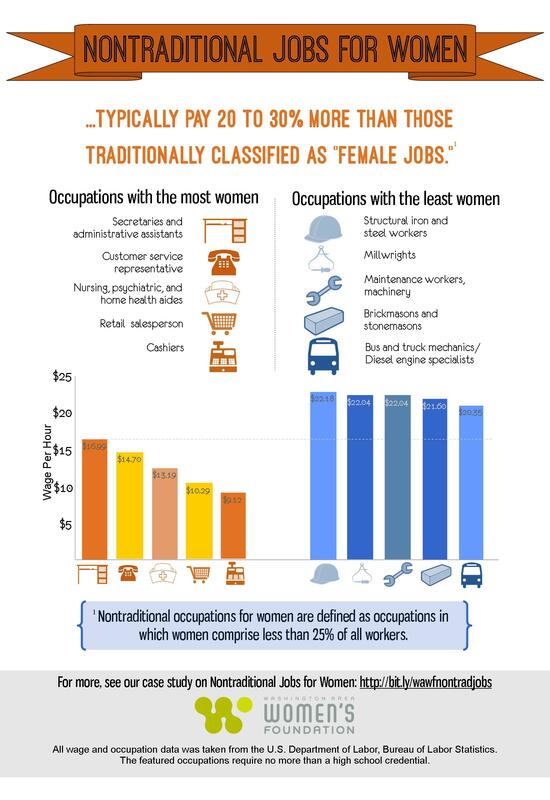 Nontraditional occupations for women are occupations in which women comprise less than 25% of all workers. Civic engagement is a critical issue for women and their families - raising voices at the polls and in the legislature are key to ensuring that issues affecting the lives of women and their families are being given consideration. Investing in women and girls in our region has never been more critical. How do we realize our vision of the Washington region as a model community that ensures women and girls are on a path to prosperity? We take pride in providing timely, transparent reporting about our finances, grantmaking and other organizational activities, and progress towards this vision. Our most recent reports are below. Audited Financial Statements and 990s. We’ve collected several of the best resources available on women’s philanthropy, workforce development, asset building, early care and education and two-generation strategies from across the web. Giving to Women and Girls: Who Gives and Why? New research from the Women's Philanthropy Institute at the Indiana University Lilly Family School of Philanthropy shows for the first time who gives—and why—to women’s and girls’ causes. Washington Area Women's Foundation donors participated in the study. The Annie Casey Foundation released a report on how the two-generation approach creates opportunities for whole families. There are differences in how poverty impacts women. But, does gender make a difference in financial knowledge, behavior, and well-being? The road to economic prosperity begins early. New partnerships and programs show potential to bring parents and early learners together. A state-by-state look at the data on household financial security and what states can do to help Americans build and protect assets. The Institute for Women's Policy Research's Status of Women reports are a unique source of comprehensive information on women across the United States. Depending on the nature of the domestic violence, abused partners can avail themselves of criminal or civil domestic violence help in the form of intervention and protection, and more legal options. Veterans have been there for our country, protecting us from dangers we could not see, dangers we did not hear, and dangers we did not know existed. Veterans have stood on the frontline during combat. They have made decisions that most could not make. They have withstood pressures that would crumble many. These men and women deserve our undivided attention and our help when it comes to a dependence on any substances.